Read this blog to know what all happened in the mutual fund industry in the year 2017. Year 2017 was one of the game changers in the history of mutual fund industry. This was the year when the mutual funds were recognized as low-cost and value-for-money products for the common man. As a result, it laid the foundation for the rapid growth of investments in the coming years. This boost in the industry was backed by some events that took place in 2017 and have a spillover effect in 2018. Post demonetization, the financial space has undergone a fundamental change where it had a considerable amount of unprofitable capital. 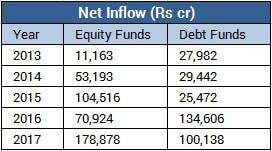 The need of investing this capital in a productive way simulated the inflow to the equity mutual funds. Consequently, the mutual fund industry comprising of around 40 players saw 40% growth in the total AUM in a single year. Breaking the bull-run records of 2006-07, the sector reached the mark of Rs. 23 lakh crore approximately, last year. At the same time, the relative underperformance of the real-estate sector, gold, and the decline in the interest rates of the fixed deposits have also accelerated the investment trend in mutual funds. The conventional macro environment along with the after-effects of the demonetization triggered a rise in the equity market that lured not only the first timers but also compelled the old investors to hold on. Experts are anticipating that mutual funds will keep attracting the investors unless the political and economic policies of the country get more rigid in 2018. There were two major norms proposed by SEBI in 2017 which will have a substantial spillover effect in 2018. First one was a proposal for strict segregation between the mutual fund advisors and distributors. Separation of investment advisory business from the execution services will make the sale and distribution of mutual fund products more transparent. Secondly, the new categorization and rationalization rules for the mutual funds released by SEBI in October guided the mutual funds to follow the one-scheme-per-category rule to encourage generic labeling of the schemes. SEBI guided the mutual fund companies to follow a standardized pattern of categorization and keep their products true-to-label in order to end up the confusion among the investors. The new norms will drive the distinct positioning of the funds and lead to potential changes in the funds’ attributes. The regulations are designed to help both the advisors and investors in making selection and deciding the most valid option for investment. Another highlight of the year was the growing popularity of the ‘balanced advantage’ funds. Preference for balanced or hybrid funds clearly demonstrates the increase in investment knowledge and mature behavior of investors for such funds. These funds were promptly launched by the mutual fund house as the investors were convinced by their allocation strategies. And this trend is expected to endure in 2018. Balanced funds provide investors with exposure to both equity and debt, based on the relative market valuation which reduces risks. By the end of 2017, S&P BSE Sensex closed at an all-time high, and the equity benchmark recorded approx 30% as full-year total return, whereas Nifty 100 returned over 32% encouraging the investors towards equity and hybrid mutual funds. Indian small-cap stocks have outperformed their counterparts as S&P BSE SmallCap index yielded a total of over 60% for the past year. Talking of the sector-wise performance, S&P BSE Consumer Discretionary Goods and Services enjoyed the settlement of the GST in the market combined with the reduction in the tax rates and improved outlook towards the Indian economy. Consequently, S&P BSE Consumer Discretionary Goods and Services generated 55% yearly returns. All these exemplary figures have changed the mindset of the investors and convinced them of the fact that equity markets can be volatile, but investment in equity with a long-term horizon can create magic. Many new investors in conjunction with the existing ones contributed to the growth of the mutual fund industry and got rewarded in return. 2017 observed another milestone in the mutual fund industry when Reliance Nippon Life Asset Management Company went to the market in October last year. The third-largest fund house in the country became the first one to release an IPO and got a positive reaction from the market. Following the footsteps, the second-largest mutual fund house, HDFC Asset Management Co. Ltd. is expected to get listed in 2018. Apart from this advancement, the government continued to disinvest its stakes in the state-owned companies through ETFs. As a part of this process, the government disinvested its stake in the companies forming a part of S&P BSE Bharat 22 index and amassed the largest amount from a new fund offer ever. The idea of mutual funds was employed to provide an easy and growth ensuring product for investment to the common man. Mutual fund industry possesses the potential to outperform its peers and the foundation for the same has been laid. It only needs to keep on evolving with ideas to add value to the customers. The journey from ‘Mutual fund investments are subject to market risk...’ to ‘Mutual Funds, Sahi Hai’ has made its true sense with the evident double-digit return percentage over the past years. For more information related to the mutual fund industry, stay tuned with us.